Over the last few months, I had met up with a few clients and they shared with me that they see no reasons for them to upgrade their MediShield plans and they are adequately covered. And I took the initiative to go through with them what they are being covered and conclusion is that most of them do not really know what they are covered. So instead of promoting why they should upgrade their current coverage, I would rather let them know what they are being covered and let them decide whether to upgrade. If you are one of those who know that you have a MediShield Plan but do not what you are being covered, this post will give you a clearer picture! 2. What Are The Benefits Under MediShield? 3. How Much Is My MediShield Premium? 4. How Do I Know If I Have Already Covered Myself / My Dependents(s) Under MediShield? So what are these Figures? Basically they are the daily limits. Medishield do not really limit you to any hospital type and ward (but in reality, it’s around Ward B2 and C), so if there’s any hospitalization involved, you have to check out with the Hospital the Daily Inpatient and Miscellaneous Charges for your Ward. If it’s normal ward and $450 per day and below, this amount will be added up with the rest of the charges and summed up against the Deductible. If it’s more than $450 per day, e.g. $500 per day, you have to take to account that you need to pay the difference of ($500 – $450 = $50 per day) whereas the rest of the $450 fall against the Deductible. If you have downloaded the PDF from the link above (under the Benefits of MediShield), you can actually click on “Table 1 to Table 7” which will bring you to the MOH Website where you can see an exhaustive list of Surgical Operations Procedure. Usually any Surgical Operations done will fall under one of these Tables. If it’s not, you need to ask the Hospital whether it can be claimed under your MediShield. So similarly, the figures you see on the right are the maximum limits. Anything that’s below, that exact amount will be added against the Deductible. If the amount is higher than the limit of that Table, you have to bear the difference, then the maximum will be added against the Deductible. MediShield does cover some OutPatient Treatments, i.e. you are discharged from your Hospital Stay and because of the illness complications, you may have to return for regular outpatient treatments. Similarly, these are the daily limits for each particular treatment and you do have to check with the Hospital whether these charges are just below or above the limit. The above rules will apply. And good thing that the Deductible does not apply. And a good thing to note about your MediShield Plan is that it has a Maximum Claim Limit for Lifetime, first, your total hospital bills cannot exceed more than $50,000 and in a lifetime, it should not exceed more than $200,000. By default, should you exceed the maximum amount for a lifetime, your Plan should stop to cover you. But till date, I have not came across such scenario, so I cannot give you a clearer picture on this. Similarly for the Maximum Per Policy Year. This is a good sign that all these Clients that I have met up are Healthy! What’s This Deductible And Co-Insurance? I have been talking a lot of Deductible, so what does this mean to you. If after taking all the necessary claimable charges into considerations, and you get a Final Claimable Bill figure (also after Government Subsidies, if any), you will match it against the Deductible. For e.g. 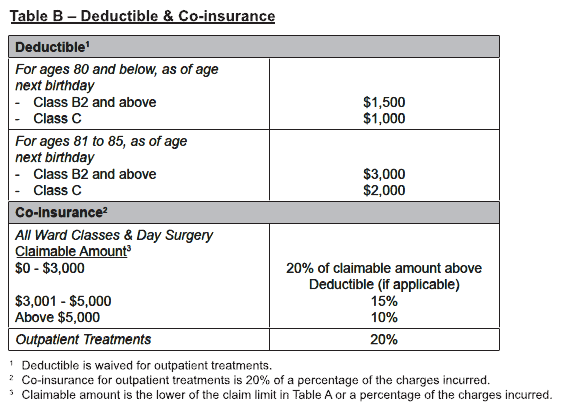 if it’s a Class C Ward Stay and Treatment, and the Final Claimable Bill figure is at $2000 and the Deductible according to the Table above is $1000, this would mean that you have to pay the $1000 (the Deductible amount) out of Medisave (if claimable) and/or Cash. The Rest of the amount ($2000 – $1000 = $1000) will fall under the Co-Insurance where according to the Table, you will need to pay another 20% of the $1000 = $200 out of your Medisave and/or Cash. So out of a $2000 bill size, you are able to claim $800 from MediShield and $1200 out of your Medisave and/or Cash. 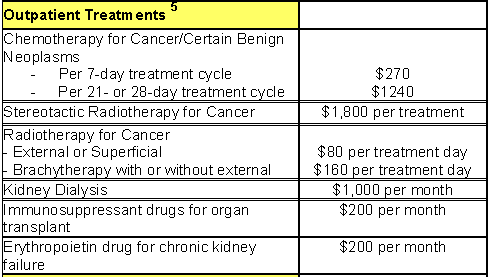 If the condition is minor or because of some other circumstances, the Total Final Claimable Bill Size is below $1000, e.g. $800. Guess what, you will not be able to make any claims out of your MediShield and you may have to accumulate with other Inpatient Hospital Bills (if any) to hit above the $1000 mark. And now that you have a Clearer Picture of how your MediShield works, the decision to upgrade will be up to your own options and preferences. If you are keen to explore any upgrade options, please feel free to contact me.